Is the House of Lords a gerontocracy? Posted 31st March 2017 & filed under Ageing, Blog, Intergenerational Justice, Projects. A recent BBC documentary series about the inner workings of the House of Lords (Meet the Lords, available on iPlayer at the time of writing) contained a remarkable statistic: the average age within the House of Lords is currently over 70, with a number of the oldest peers being in their 90s. Several contributors to the programme identified this as being one of the current system’s flaws, with the Lib Dem peer Lord Tyler joking that the House of Lords is really “the best old-age day care centre” in London. Does this mean that the membership of the House of Lords is too old to represent young peoples’ interests effectively? And is there anything that could be done about it? As many people who contributed to the BBC documentaries pointed out, life in the House of Lords has plenty of features which look strikingly anachronistic to modern eyes. It is officially still “morning” until prayers have been read within the Lords’ chamber, regardless of when this happens during the day; votes (known as “divisions”) are still conducted by counting the number of peers who physically walk through either of the two voting lobbies beside the chamber during an eight-minute spell after a vote has been called, which can happen at almost any time of day; the messengers who work within the Lords wear black from head to toe because they are officially still in mourning for Queen Victoria’s husband Prince Albert, who died in 1861, and so on. However, the House of Lords has undergone dramatic changes in recent years, following the reforms put in place by the last Labour government. This removed all but 92 of the hereditary peers and gave the government more powers to nominate new peers; as a result its size has been growing and now stands at 859 (although the average attendance numbers around 500, and the overall total is still significantly smaller than it was before the reforms). This gives it the distinction of being the second largest parliamentary body in the world after the National Peoples’ Congress of China (it’s a peculiar fact of democracy that the worlds’ two largest legislative chambers are both relatively powerless). One of the main concerns behind Labour’s reforms was to make the House of Lords more representative of the population as a whole, in particular by enabling the government to create new peers who would make the chamber more diverse. However, at least in terms of age, that does not seem to have happened. A recent study by the Electoral Reform Society showed that 54% of peers are aged 70 or over, while just two are under 39 and only 29 are under 50. It is no surprise to hear that the Lords is still unrepresentative of Britain as a whole: the same study found that fewer than one in four peers are female, and – despite Labour’s reforms being designed to bring in more peers with expertise from outside politics – over a third are former politicians. How much does this matter? 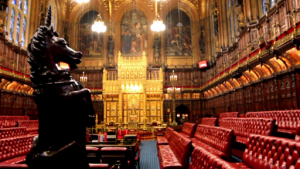 As it is unelected, the main role of the Lords is to scrutinise the government and try to improve legislation by proposing amendments to bills, but it cannot legally force the government’s hand. However, the power of the Lords is arguably greater at the present time than it has been previously because the Conservatives lack a majority in the Lords, so in light of the relatively few checks on their power that they face in the Commons, the Lords has managed to force a number of changes in government policy by inflicting embarrassing defeats on them. Many commentators have argued that Brexit will give the Lords greater prominence still as the vast amounts of technical deliberation that will be involved are likely to overwhelm the Commons. But if we are concerned that the people who govern us should be representative of the population, then the current composition of the Lords feels problematic. Unfortunately, there are a number of reasons why lowering the average age of the members could be tricky. First and foremost, it would require the elevation of a clutch of new, significantly younger peers, which would probably require the removal of some of the existing ones in order to avoid making the Lords so large that it becomes dysfunctional. Secondly – although just as significantly – ambitious young people who want to change the world by forging a political career probably wouldn’t join the Lords even if they were asked, because of their perceived lack of influence, and as it would preclude them from seeking higher office (not to mention that Lords are unpaid, although they can claim up to around £300 per day in expenses). Thirdly, the current system we have is in some senses a meritocracy: new peers are supposed to be nominated because their previous experiences can contribute to the quality of legislation – but this militates against younger people entering the Lords because they naturally need to have reached a certain age before they can acquire such experience. Of course it is easy to become obsessed about the representativeness of our institutions in a very superficial way: the Lords appears to do its job quite successfully, judging by the number of Lords’ amendments that are added to bills, for example. However, in an era of growing disillusionment with politics, the fact that it’s easy to perceive the Lords as a lavishly-funded retirement home for ageing former politicians (several of whom have dragged its reputation through the mud with expenses scandals) must be damaging to the general perception of politics. Image: The Chamber of the House of Lords. Reproduced from Wikimedia Commons under the terms of Creative Commons, CC BY 3.0. Source: UK Parliament – https://www.youtube.com/watch?v=_sLZBWcPklk @ 01:06.